Connect a HDTV, DVR with HD Satellite TV, 5.1 surround sound. o HD Satellite TV signal source IN. o HDTV set with audio/video inputs, DVI input. o One RF coaxial cable. o One set of Audio/Video RCA cables (1-red & 1-white audio). o One digital audio cable. o One DVI digital video cable. o HD Satellite TV receiver with DVR. o Audio/Video receiver with Dolby Digital 5.1 decoder. You can view High-Def satellite TV programming and record HDTV and standard def TV shows. When present, you can listen to 5.1 surround sound. o Watch satellite TV only. The TV will need to be set to the DVI input. 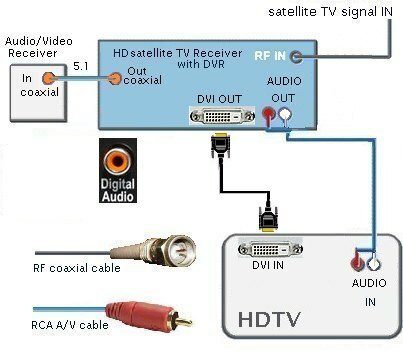 TV programs are selected on the satellite TV receiver and output to digital TV. Digital audio surround sound is output to A/V receiver to drive loudspeakers. DVI has been replaced by HDMI on current components. Substitute HDMI where DVI is shown. HDMI is video and audio in one cable.